Angelito’s first match since October. Rudos took 1/3. Cuatrero & Angel de Oro swapped the first two falls, weren’t involved in the last. Rudo Fuego is probably just randomness. I guess we’ll see. After the match, Indy Nation sang happy birthday to Toxin and invited him to join. He said no and got beat up. Centvrion and Metaleon are probably headed to a mask match sometime in 2018; they made the challenges again after this match, as they did in XMW. I’m not sure it’ll happen in this promotion. They drew badly once again. The way people are promoting these action matches cards in Arena San Juan is clearly not working, they draw less than hope for every time, someone really needs to try a something different to make people care. It’s been this way for a while and no one’s tried a something different, so I don’t suspect it’ll change. The Ninja Turtles, inspired by WWE RAW 25, started doing WWE tribute spots during their match. 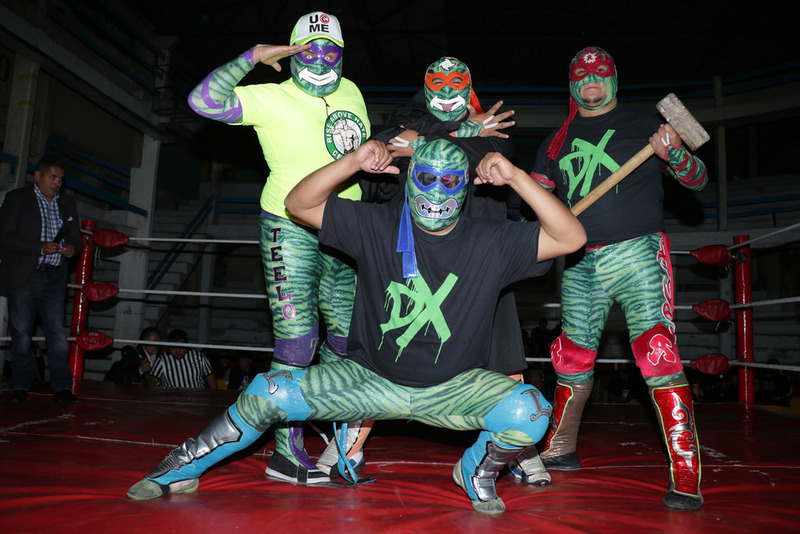 1) Angelikal, Hijo Del Vikingo, Solaris b Ángel Mortal Jr., Tigger Boy, Villano III Jr. This was a free show, sponsored by the government to give a city affected by the September earthquakes something to get together. El Sol de Cuautla lists the turnout as 6000 (and that’s the number AAA went with), La Union says 7,500. Both of them also disagree on who’s on which side in the main event, only being sure Psycho beat Wagner. Matt B pointed out this lineup last week, wondering if this meant Hijo del Wagner was turning on his dad. I didn’t even respond because of course AAA house show lineups have nothing to do with reality! I was very wrong. In conjunction with this show, AAA announced they’re taping TV in Cuernavaca on 03/17. By my math, that should be the day of Ultima Lucha 4 tapings in Los Angeles. Maybe my math is off. Maybe the LU guys just skip that taping. I dunno and it feels like not worth speculating, we’ll know soon enough. In the past, Lucha Underground announced their tapings close to three weeks in advance. This upcoming Friday is three weeks away from the first show, so it could come any time this week. Next Friday’s AAA TV in Toluca didn’t have a main event. It does now: it’ll be Dr. Wagner Jr. vs Psycho Clown vs Vampiro. Vampiro making himself in a star attraction is so old school, no bookers even bother to use their power that way any more, it would almost be ironically cool if he wasn’t so terrible as wrestler. He appeared winded just playing a referee on Friday night. I want to say the Cero Miedo match was the worst thing to happen, because it convinced Vampiro he’s got enough to have another run , but Vampiro would’ve been convinced of that anyway. He’s Vampiro. EMW, who hasn’t been seen in a while, says they’re also hosting an AAA TV taping in Tijuana in the near future. Okumura wasn’t at the show because he was still in Japan, and is apparently flying back with Kaho Kobayashi. She starts on Tuesday. Rey Mysterio Jr. made a surprise appearance today on WWE’s Royal Rumble. PWInsider says it’s currently a one night deal. Rey did well, and both sides always have the option to go for a longer deal if they want to – it doesn’t seem like he’s bound by a contract to anyone at this point. He was so over that I kind of expect him to be on their show tomorrow, but that still may not mean anything long term. As far as I know, shows he’s booked on still are under the impression Rey’s working those shows at this point. This week’s AAA TV is up, with a main event of Hijo de Dr. Wagner Jr. vs Hernandez where the winner gets to choose a stipulation for Dr. Wagner Jr. vs Johnny Mundo at Guerra de Titanes. I wonder what will be chosen! Mr. Iguana introduces himself to the Lucha Memes fan. This is a very good idea, don’t assume everyone knows everyone. SuperLuchas has an interview with Violento Jack. Jack names his favorite wrestlers as Canek, Mick Foley and Kenta Kobashi, which is a three not many people have together. His answer for what company he’d like to work for is pretty good. A lucha libre exhibition opened in Queretaro. Lunatik Extreme shaves Demonio Infernal, Artillero becomes Príncipe Odín Jr.